Why struggle with cords that are too long or too short? Why use those unreliable adaptors. 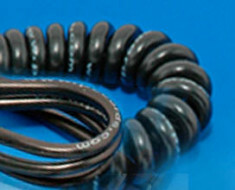 We will manufacture a factory made heavy-duty cord that fits your equipment exactly. A custom cord organizes your equipment, the way you want it, so you can concentrate on being creative. You can order a cord straight or coiled, anywhere from 6 inches to 100 feet. We have a wide selection of tips from which to choose. to place your order. If you do not see what you need on our site e-mail us or give us a call.